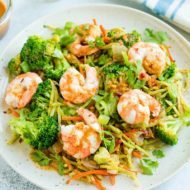 Have dinner ready in less than 20 minutes with this healthy lo mein with shrimp and zucchini noodles. It’s loaded with veggies and perfect for busy weeknights. Paleo and gluten-free. There’s really nothing better than quick, healthy meals that you can toss together in a single pan. Amirite? Well… I can think of a feeeew things, but seriously one-pan meals are such a lifesaver when you need to get dinner on the table quickly. 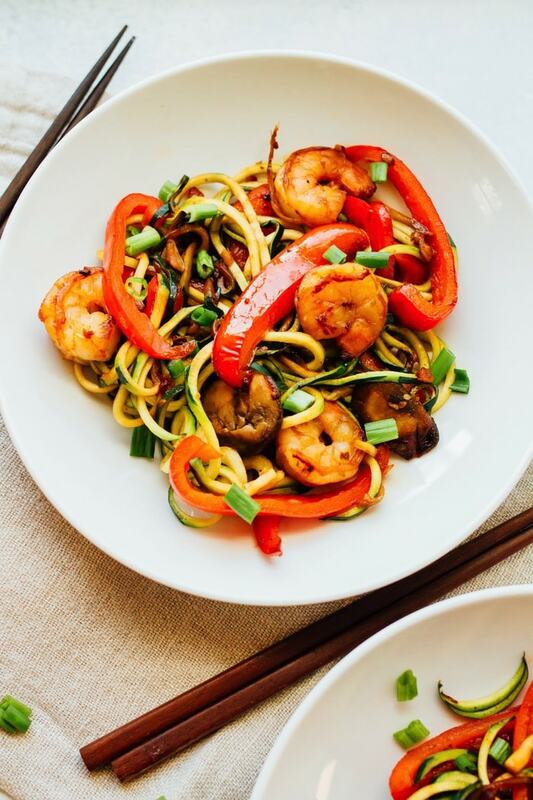 This flavorful and easy zucchini noodle shrimp lo mein. 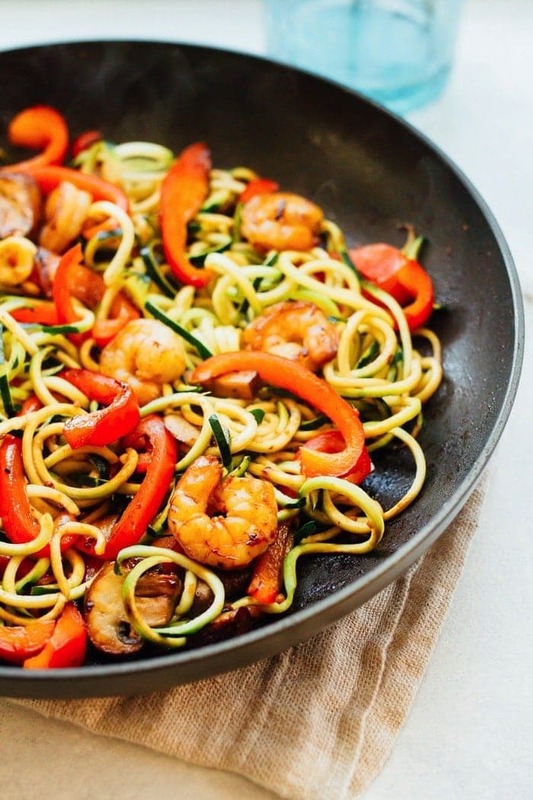 loaded with fresh veggies — garlic, onions, mushrooms and peppers, protein-packed shrimp and a pile of low-carb zucchini noodles. The sauce is super simple with just soy sauce (tamari or coconut aminos work if you’re gf), honey, sriracha, sesame oil and fresh ginger. 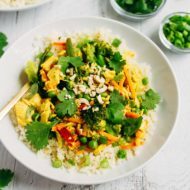 The fresh ginger gives this dish a light spice with a hint of sweetness that ground ginger can’t provide. Don’t skip the fresh stuff! 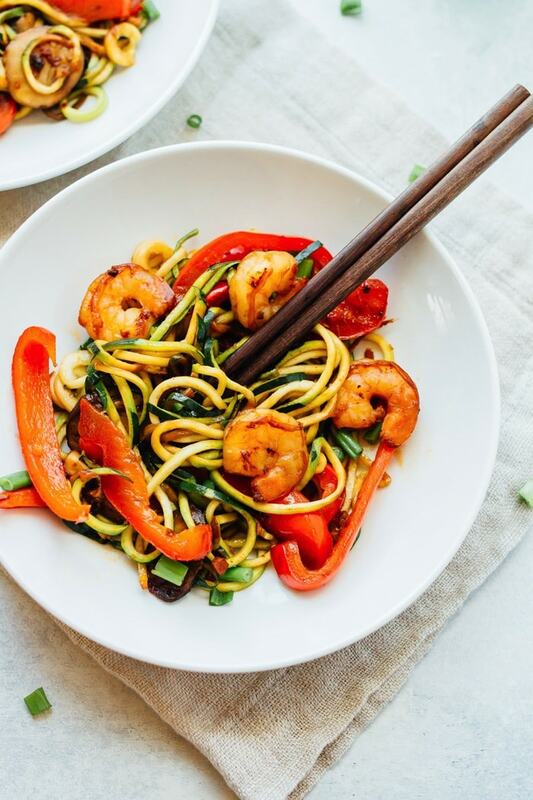 Of course this zucchini noodle shrimp lo mein probably won’t taste exactly like lo mein from your favorite Chinese restaurant, but it’s absolutely delicious and healthy! Plus, you can make it faster than the time it would take to find the takeout menu from your kitchen junk drawer. <– After writing that I just realized I probably sound really old. No one keeps Chinese takeout menus in their kitchen anymore, do they? Nope, because there’s this thing called the internet and it has every food menu you could ever need. Anyhow, I hope you love this zucchini noodle shrimp lo mein recipe as much as we do. It’s definitely an easy one that you’ll love having in your back pocket for busy weeknights! 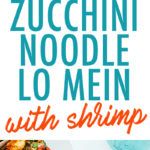 If you make this shrimp and zucchini noodle lo mein please be sure to leave a comment and star rating letting me know how it turns out for you! Your feedback is helpful for the EBF team and other EBF readers. 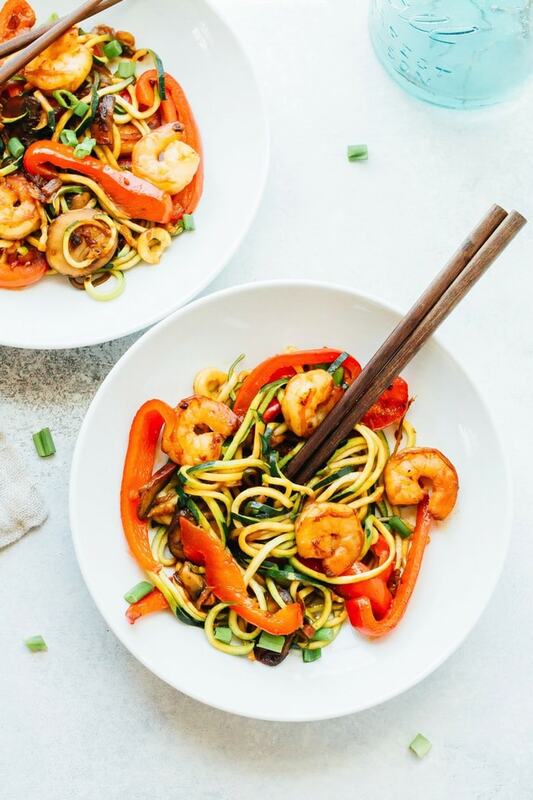 Have dinner ready in less than 20 minutes with this healthy shrimp and zucchini noodle lo mein. It’s loaded with veggies and perfect for busy weeknights. Paleo and gluten-free. Spiralize zucchini noodles if you haven’t already. Whisk together sauce ingredients (soy sauce, ginger, honey, sriracha and sesame oil) in a small bowl. Set aside. Add oil to a large skillet or wok over medium-high heat. Add onion and garlic and sauté until fragrant, stirring frequently to make sure garlic doesn’t burn. This should take about 3-5 minutes. Add mushrooms, bell pepper, shrimp and sauce to the skillet and sauté for 5-6 minutes or until shrimp are cooked through. Turn up heat a tiny bit and allow liquid to evaporate. 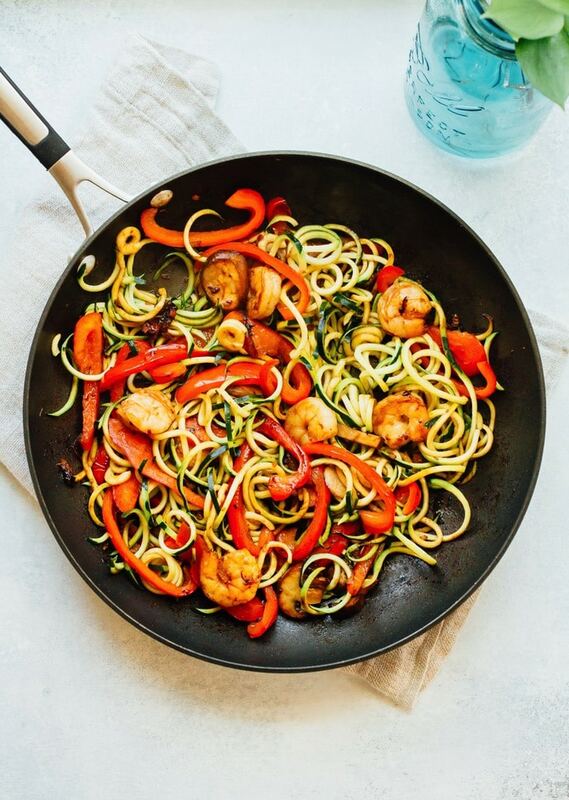 Add spiralized zucchini noodles to the skillet and toss to combine. Cook for 1-2 minutes until zucchini noodles are just heated through. Do not overcook the zucchini noodles or they will start to release water and the lo mein will become watery. Remove from heat and serve immediately. Serve in two plates or bowls with chopped green onion and additional sriracha. Last year, around this time, I teamed up with a few of my favorite bloggers to bring you a host of one-pan meal ideas. <– I shared this curried shakshuka, which is so delicious and still an EBF favorite. If you haven’t tried that recipe yet, DO IT. You will love. The one-pan meals we shared last year went over really well so today we’re teaming up for another round of must-make skillet meals. They’re all healthy, delicious and require only one pan. Hooray for easy clean-up! Ready to see the full lineup? I LOVE that you used zoodles for lo mein! 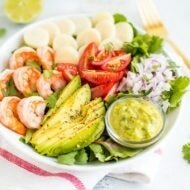 I have a bunch of shrimp sitting around and now I know what to make! Only a food blogger would have a bunch of shrimp sitting around. 😉 Enjoy, Taylor. I totally do have Chinese takeout menus in my kitchen. But definitely going to try this. I have zucchini I need to use up! Love it! I knew there would be a few people who would get that reference. 🙂 I hope you like this recipe, Maggie. How do you do the zucchini fi you do not have a spiralizer? Thanks! I will forever be in love with zoodles and one pan meals. Which means I’m in love with this dish and you! Hehe. Mwah! this looks so healthy and yummy! I need to get a spiralizer soon. Looks positively scrumptious Maria! And healthy to boot! YUM! Those colors look amazing. I’ve never been a huge shrimp fan, but this may convert me! Hahaha, I totally have a Chinese menu in my junk drawer so I’m equally as old. Trying this out this week because without fail, I always have a zucchini surplus going on in my veg drawer. A little over ambitious with the zuke consumption apparently. Glad I’m not the only one! And you’ll have to let me know what you think if you give the recipe a try this week!! if you made this dish vegetarian, how would you add protein without using tofu? I’d probably use tempeh, edamame, mushrooms, lentils or black beans. But you could also just load it up with extra veggies like broccoli and spinach… both of which have plenty of protein. Let me know if you end up trying a vegetarian version of the recipe! 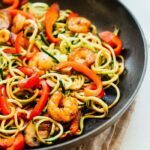 How are zucchini noodles as leftovers or for meal prep? I’ve never dealt with them before. Brittany, i’m old as dirt and DO have chinese takeout menus and others in my junk drawer. Had to laugh. This was absolutely delicious. Thanks for sharing!